Many people suffer from tightness int he lower leg, foot and knee pain, and weakness with running and jumping. Most often tight calves are put to blame, but there is usually more issues at play. Beneath the big calf muscle are many more muscles that help with running, jumping, and walking. This post will touch on two primarily, the Soleus, and the Tibialis Posterior. 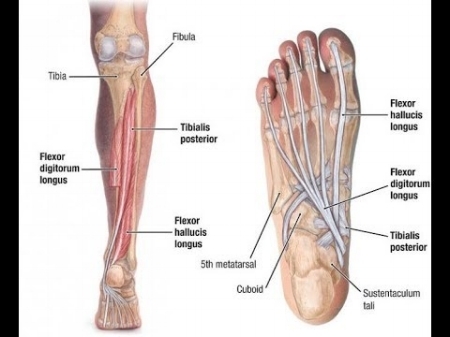 Both these muscles support the foot and ankle and play an important role in lower leg function. Shaped like a fish, this broad thin muscle starts just below the knee and attaches at the heel. The soleus often becomes tight and weak when the calf becomes overused. To strengthen the soleus we can do typical calf exercises such as heel raises or calf press but with a slightly bent knee. The bent knee takes stress away from the calf and forces the soleus to work a little more independently. The same goes for stretching this muscle, hang a heel off the edge of a step, or in the runners calf stretch but with a bent knee. The Tib Post also lies behind the calf, starting below the knee and it's tendon wraps under the inner arch and attaches to the bottom of the foot. This muscle also helps with running, walking, and jumping, but plays an important role in maintaining a healthy arch as well. When this muscles is working properly ti can lift the arch and prevent flat feet and plantar fasciitis. Bent knee heel raises while squeeze your heels together is a great exercises for engaging the tibialis posterior.